Agave parryi – Parry’s Century Plant, Flagstaff form, hardy in Zones 4-10, (on the right in the picture below). I am a little worried that I might need to move this one. Its flattened appearance seems to be saying “Sun…I need more sun!” poor guy. The acanthus ended up shading him more than I thought it would. The small slightly deformed one on the left (above) is a pup from an Agave ‘Burnt Burgundy.’ Since it was a freebee, coming along in the pot with its mom; it went into the ground as an experiment. This will be its first winter in the ground; it should be hardy to just under 20 degrees, I am willing to loose this one, but hopefully that won’t be the case. 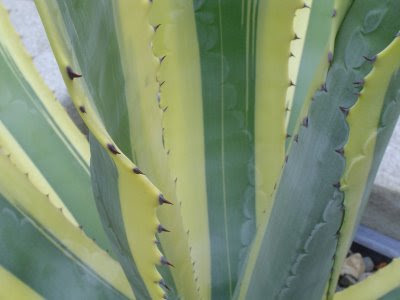 Agave havardiana – Harvard’s Century Plant, hardy in Zones 5-10. My finger tips included for scale, the other two from High County Gardens are the same size. Agave toumeyana, hardy in Zones 7 4-10. These are all planted in the ground, next to the retaining wall around our “sunken” patio. This location seems ideal because it receives little summer water (unless I purposely water them) and the soil is back-filled over a layer of crumbled cement block at the base of the wall, providing excellent drainage. I also suspect that during the winter months the sun on the concrete wall may warm the soil behind it a bit, but I have no actual proof of that. Just a theory. 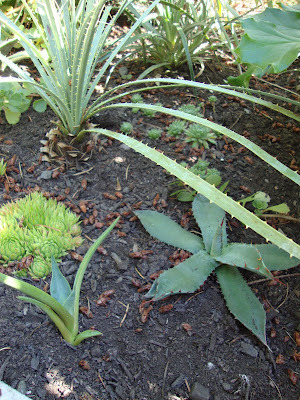 The soil in most of my garden is slow draining rocky clay, thus site selection and the ability to provide excellent drainage is key when planting an agave in the ground. 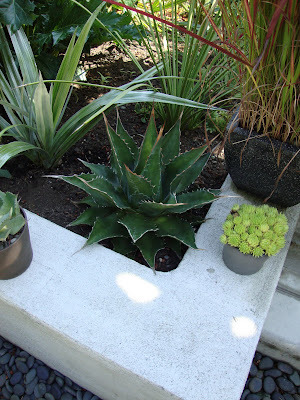 Those of you that live in more agave friendly climates are probably looking at these pictures and thinking…silly girl, those are going to get huge and she has planted them too close together and too close to the wall. I realize that I may have to move at least one of them some day, I will consider myself lucky when, and if, I have that problem. 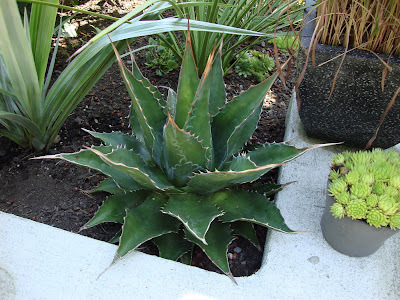 This is my largest and most successful agave planted in the ground; Agave montana 'Baccarat' a beauty isn’t she? 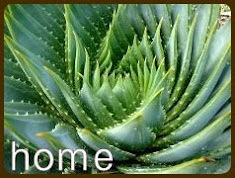 If you click on the link (in the name above) you may notice that the description includes these words: “slow to moderate growing agave forms solitary artichoke like rosettes that can grow to 6 feet wide.” Obviously I was concentrating on the “slow” part of that sentence rather than the “6 ft wide” part when I planted this one. I chose the placement based on getting it the very best drainage possible, I was quite skeptical that it would make it through the winter, but it did, and last winter was a real test! The only protection it received was a sheet of bubble wrap placed over it with burlap on top of that, the burlap to keep the sun from damaging the leaves through the magnifying glass-like bubble wrap. This protection was only in place during our arctic event where the temperatures were below freezing day and night for over a week (or was it two? I have tried to forget that horror). 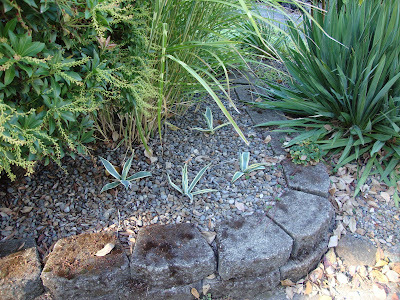 Agave Gentryi ‘Jaws’ is a new addition to this same well draining area, I saw him and fell in love; he went in the ground last spring. According to the San Marcos Growers website this is one of the most cold tolerant of the large agave, tolerating temperatures down to 5° F. There is that size issue again…they say this one will grow 4-6 ft wide, and possibly up to 8 ft wide. I am doubtful these plants will reach their full potential size in our Portland climate. I may be wrong, and again, I welcome that! One of these pups spent last two winters in the ground (upper left hand side) it was tiny, about 1 and a half leaves, when I planted it. It has received the same protection as described above for the A. montana. A second pup (upper right hand side) spent last winter in a terra cotta pot with no additional projection other than going inside our unheated garage during the previously mentioned “arctic event.” I was basically sacrificing it to the winter gods, it went into the season looking pretty rough and I wanted to see if it would make it outdoors in a pot. It had sustained damage from the newspaper delivery person (three broken off leaves…I shouldn’t have had it on the front porch) and if it died I wouldn’t have been upset. But...it lived! Its reward was a place in the ground. As you might be able to see it still has a bit of decay on one of its leaves. I chose this location for a pup grouping because it is highly visible, right next to our driveway, and it is a raised bed that should have good drainage. That part is a little hard to see in the picture but there are two retaining wall blocks that build up a little height. Personally I don’t care for the blocks but we inherited them and until we tackle the long list of other home improvement projects we are stuck with them. This area gets direct morning/early afternoon sun in the summer and morning into the late afternoon sun in the winter, when the neighbor’s tree has lost its leaves. This huge (4 ft "wing-span") specimen has spent the last 2 winters outdoors in this pot. 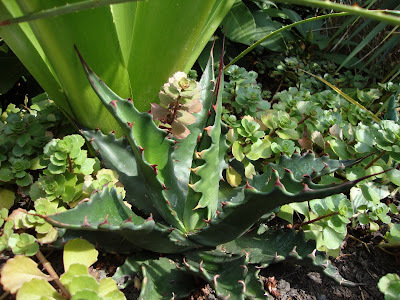 He is planted in a mixture of soil and chicken grit (to improve drainage, I try to do this with all my potted agaves). During the winters I was religious about rolling him in and out of the garage based on the weather forecast, making sure he stayed fairly dry over the winter months. Yes I was a little overprotective, but I couldn’t bear the thought of watching him turn to mush. He had no winter protection other than the unheated garage on really rainy days and during cold snaps. This year will be different and he’ll be spending the wet winter under our shade pavilion. We will be constructing plastic walls to help keep him (and a few other plants) dry and hopefully a little warmer than in the outside air. 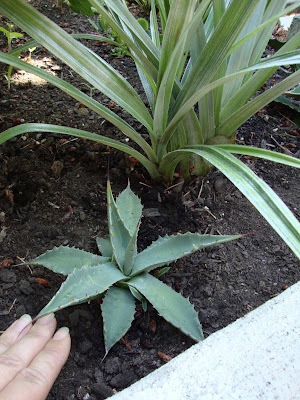 This pup might be this year’s sacrifice to the winter gods; I planted him adjacent to my small lawn, so he receives summer irrigation and is one of the least free draining of all my in-ground agaves. He is setting in and on a gravel/soil mixture; I hope this will give him a fighting chance. 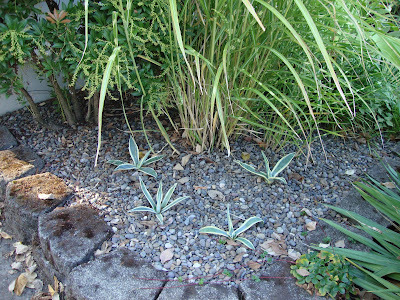 There are a couple more pups like him tucked in other places with similar circumstances (minus the gravel); since I experienced a windfall of these little agaves from my brother I’m testing their hardiness in a few spots that are not ideal conditions. 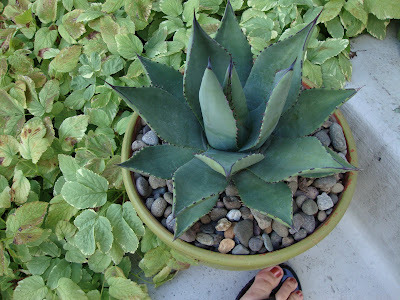 The only other agave that I’m sure will be spending the winter outside is this Agave parryi (my toes included for scale). I had every intention of putting this one in the ground but just haven’t found the right place. Since he should be hardy to below freezing I’m hopeful he’ll be fine. He may get to live in the shade pavilion “greenhouse” or maybe I’ll just see if he can tough it out with no protection at all. 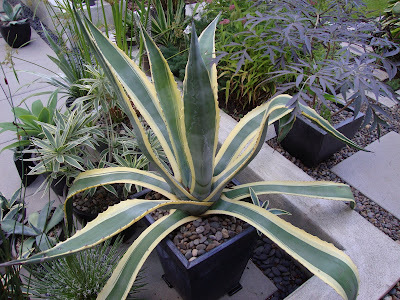 I do have mixed emotions on the topic of agaves in well draining pots spending the winter outside. I am willing to risk it if I know that the particular agave is hardy to around 10 degrees cooler than the predicted temperature. 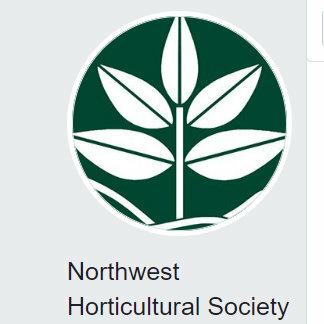 My theory has always been that hardiness ratings are for plants in the ground, and plants that are in pots have less insulation protecting their roots than those in the ground do (at 30 degrees the roots of an agave planted in the ground are going to be warmer than an agave planted in a pot, right?). I don’t have any scientific evidence to support my 10 degree theory; this is just me making it up as I go long. It’s this unknown level of “pot-hardiness,” and concerns about drainage, that keep me from leaving more potted agaves outside during our cool wet winter. Those agaves that don’t meet my 10-degree rule go inside for the winter, we are lucky to have a large basement with room for a couple of grow lights. I haven’t lost one yet doing it this way and it beats having to watch the weather forecast and play the in and out game all winter! The downside is that I have to be extremely careful when I bring them out in the spring so they don’t get sunburn. Seriously! 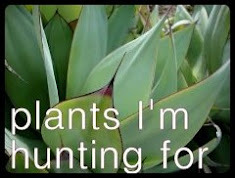 I should mention that I have lost a couple of agaves in the past. The first one was a gift that my then boyfriend (now husband) brought back from his parents house in New Mexico, hardy to the low 30’s at least. I left it outside our first winter in Portland, in a pot that didn’t drain well. I intended to bring it in as soon as the rains started but I wasn’t fast enough. So sad watching it rot. The second was an A. Americana ‘Aureovariegata’ that I purchased at Cistus on our first trip there, it should have been hardy to the mid 20’s and I thought I selected a place with good drainage. Not good enough evidently because by spring it was a pile of mush, never to return. So how many of you are still reading? 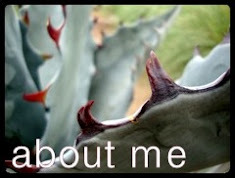 Like I said, I can get wordy, and I am an agave geek. Hopefully there was a nugget of information in there that at least a couple of you found interesting. I’ll update the status of all of these agaves if there are changes and then do a complete wrap-up when the rains let up in the spring and it looks like we are headed into warmer and dryer agave-friendly weather. Thanks for indulging me in my agave passion! Oh, I'm definitely still here, Loree. 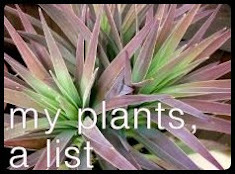 You have a very nice agave collection, and it sounds like you've got a good system for determining whether to provide cold/rain protection that's working for you. I'm particularly fond of 'Jaws' too. 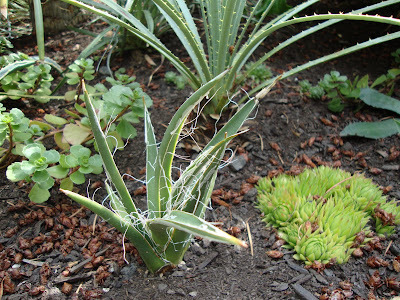 And I also plant baby agaves too close to other plants sometimes, knowing they are very amenable to transplanting when the time comes. Hey, I read to the end, do I get a prize? :) Just kidding, it was interesting. I am now worrying that mine does not have the best drainage so may have to repot or bring in. Hm. Thanks for being so thorough, and I think your experiments will be a really good resource for others in this climate who would like to grow these fascinating plants! Oh, I think my favorite of all you show is the Parryi. Something about it, just perfect. Good luck with all! I'm glad you have enough to experiment with, this should be a good sample population to tell us what we can and can't get away with overwintering agaves in Portland. Now I can't wait for winter (sorry), and then spring again. I once heard that plants in pots should be treated as though you're one degree lower, so instead of z8, your potted plants experience z7 conditions, because of the insulation issue you mention. The presentation on overwintering at the Chinese Garden last year said the ground is the best insulation around, so they recommended burying pots in the ground. I actually did it with my unplanted stuff and some smaller pots last year, and everything came through. Not with the agaves, though. I tried the Chinese garden's advice on covering borderline hardy plants with a little cage with frost cloth and burlap attached, to make little portable tents + mulching heavily. I think I'm going to add bubble wrap to that routine this year, it wasn't enough protection for anything I tried it on. I still lost all the leaves on a gardenia and a big leafed rhododendron. I love your Agave parryii. I got a small Agave parryii var. truncata at Cistus a month ago. Couldn't resist such a lovely plant! I'll look forward to reading your future Agave reports, both successes and losses. 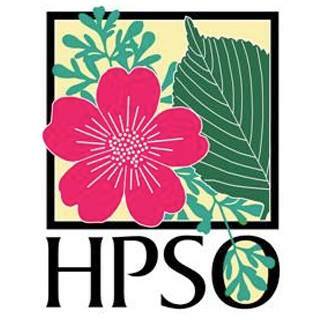 Hi, I am Victoria the CS Supervisor for High Country Gardens. You have a really nice blog, very informative. If you have any questions or would like to share with us any developments in your test sites please contact us. 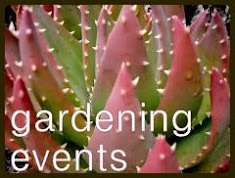 Also feel free to visit our website where we have a few articles on Agave on the garden articles link under succulents and cacti. 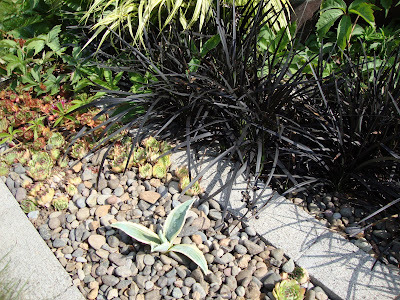 One thing I did notice while viewing your photos is you may want to move the Agave parryi and the Agave havardiana. They are small now but will get to be very large in several years and are a lot easier to relocate at this size. 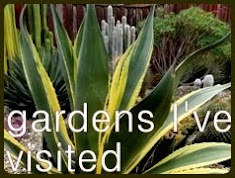 Pam, thank you for agreeing about moving the baby agaves! And since writing this I have came up with a couple more experiments for next year, things I will plant in the ground in the spring. Can't wait! Karen, your prize is a nudge a little bit further into the black hole of agave love. Soon you will find yourself identifying them by name when you see them, then you'll buy one...it will just snowball from there. The Parryi will be a good place to start! Megan, I really like the one zone cooler theory for the pots! Thank you! If you hear of the Chinese garden having that presentation again this year please let me know! Jane, glad you liked the post. Maybe your soil drains better than mine? There are so many different conditions to consider and I am by no means an expert! Wouldn't it be fabulous if your scabra did make it? If you are willing to possibly loose it then I would leave it and see what happens. I look forward to your report! Victoria, thanks for visiting! 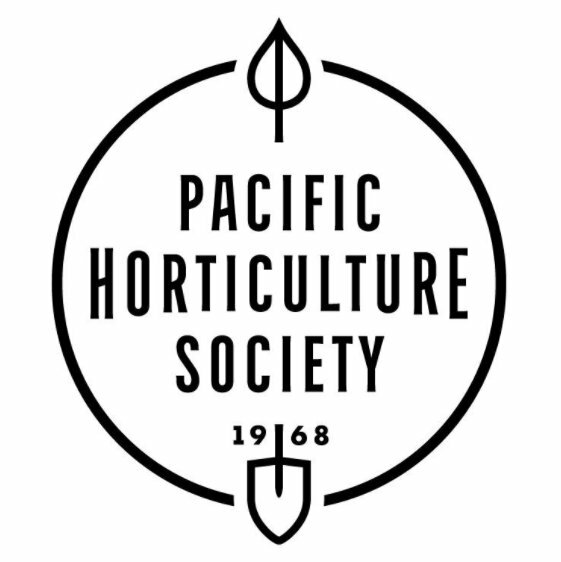 I am curious to know if you have heard from any customers who are growing these in the Pacific Northwest, on the coastal "rainy" side of the mountains. And thanks for mentioning the moving of the parryi and havardiana, but I have had a americana in the ground for 2 years now that has hardly grown at all. I just don't think our climate inspires big growth. But hopefully I am wrong! Chicken Git is typically sold at farm feed stores, although some nurseries include it in their inventory of soil amendments. You can also use perlite or pumice. I basically mix in whatever I'm using until I can't form a ball of soil with my fist, instead it just falls apart, maybe a 70/30 mix? Very late to the game here but I just wanted to say thanks for all the great info! I too live in Portland and, having spent a fair amount of time traveling in Mexico, have completely fallen in love with agaves in all their various prickly forms. On a bus trip from Mexico City to Oaxaca I was astonished to see huge gorgeous "magueys" growing in the chilly mountains and ever since I've been dreaming of growing my own here. Thanks for the inspiration! Hope that helps, and good luck with yours!